David Cameron has been warned by one of his own backbenchers not to ditch Conservative values "in the anxiety to be on the centre ground of politics". 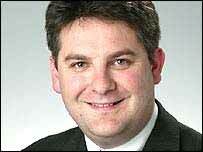 The Tory leader was targeted by Philip Davies, MP for Shipley, West Yorks in a Parliamentary House Magazine interview. "There are certain things that David Cameron has done that I don't support," said Mr Davies. He singled out the selection of future Conservative candidates through the so-called A-List as a key concern. "A list of candidates with the odds stacked in favour of one particular gender or race is not something I believe in at all," said the 34-year-old MP, who entered the Commons last year. He said he did not want to see "timeless Conservative values" ditched in the anxiety to be on the centre ground of politics. "Among party membership there is a real concern about the direction the party might be going in," he told the magazine. "I do not think it is beyond us as a party to reach out to more people than we have done at the last three elections while keeping on board those people who have stuck with us through thick and thin. "I cannot believe that is a task beyond us. There is no need to ditch our values. "You can reach out and broaden the appeal while retaining our long-term traditional supporters."